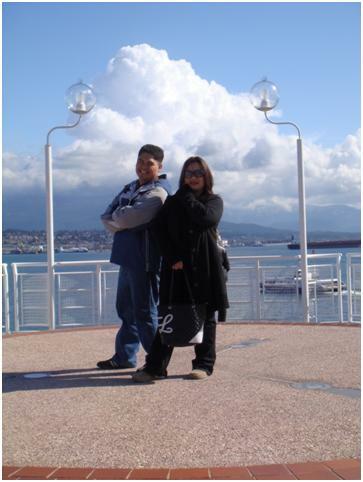 Let us depart from Vancouver for a while since I'm really itching to share this with you. 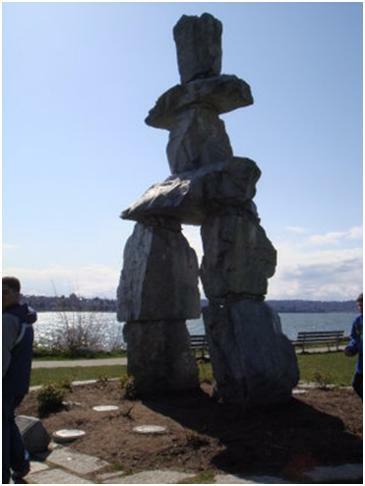 This would be one of the most unforgettable places I went to when I was in British Columbia. 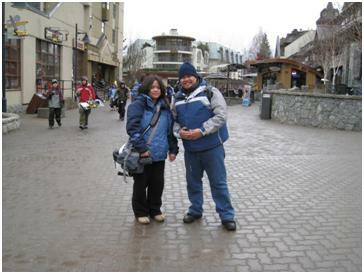 Last April, my cousins Anna and Sharoll treated me to a day trip to Whistler, British Columbia. I am so excited about this trip because it will be the first time that I'll be seeing actual snow and also mom is telling me that this is such a nice place although she went there about nine to ten years ago during summer time. The closer that I can get to snow back here at home is the frost accumulating in our freezer. 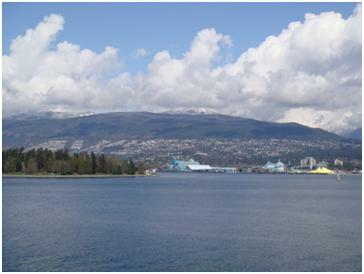 Whistler, BC is approximately two hours away from Vancouver City. 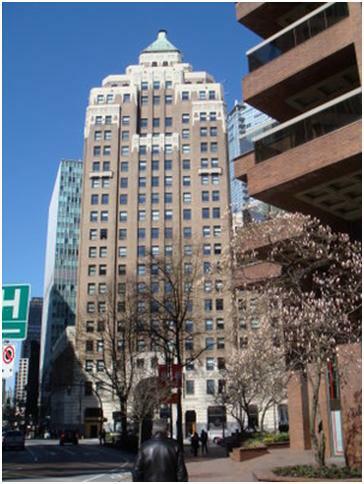 It is also one of the venues for the Vancouver 2010 Winter Olympics. 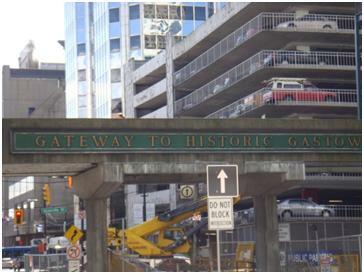 To get there you can take your car and drive through the very scenic Sea to Sky Highway, or you may opt to go to the Pacific Central Station and catch a Greyhound Canada bus to Whistler. Our choice was to take the Greyhound Canada bus to Whistler. 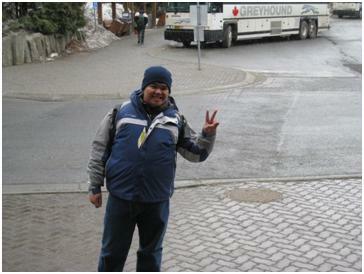 Once you get off the bus, the first thing that will greet you is this very nice and beautiful village called the Whistler Village. 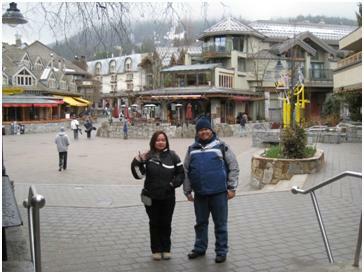 Whistler Village is a place where you can eat and shop; there are also some hotels around where you can stay. Words cannot express how beautiful the place is but here are some of the pictures (with me and my cousins). Believe it or not, snow is actually falling down from the sky at that time when we got off the bus and as a first timer I am so happy with it. After taking some pictures, we decided to go to Mc Donald's to grab something to eat for breakfast before exploring the rest of this beautiful place. The special thing about that specific Mc Donald's Branch is that all the crew are Filipinos, and yes you can hear them talk in our language. It is so nice to know that there is some place that you can feel at home even you are far away from home. Before you go, line-up to that ticket counter near the gondolas and purchase your lift tickets. 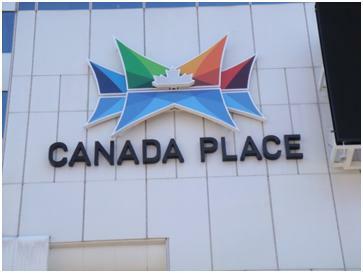 You may want to check out the Whistler Visitor Centre. 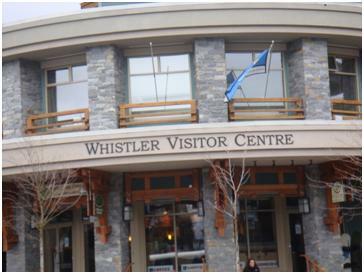 We were told by someone when we are inquiring about things that we can do around whistler that lift tickets at the visitor centre are discounted. We got our sightseeing lift tickets from there and it's really discounted. 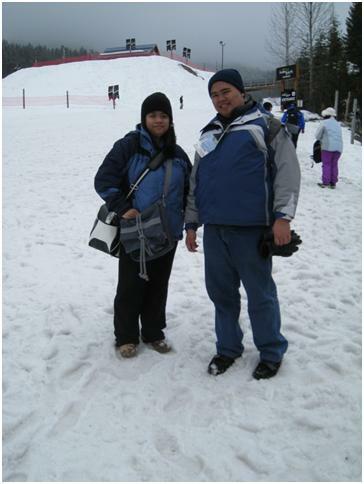 After that we went to the Excalibur Gondola which will bring us to Blackcomb Mountain. 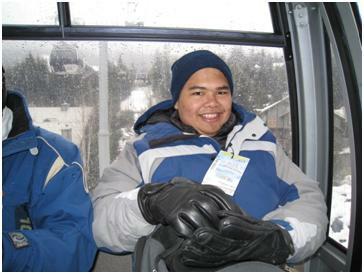 That's me in the Excalibur Gondola, all geared up for snow. 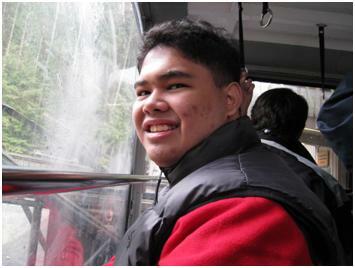 Upon reaching the end of the gondola, me as the first timer for snow explored around and experienced snow. After taking lots of pictures, we went down to base II for some more pictures with snow. [Please forgive me; it's really my first time to see snow]. One of the exciting activities for the non-skier like us in Whistler-Blackcomb is called tubing. 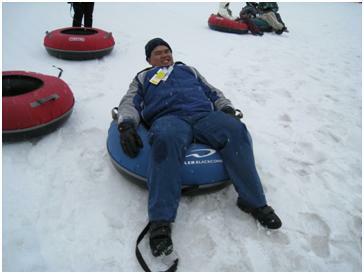 Tubing is a winter activity where you'll sit on an inflatable tube and ride the snow. Because we want to have some fun we decided to do it. And we went up and down the hill for an hour until we're all exhausted. At first since it is our first time we decided to do the tubing all together, but after that I did it by myself and it was not a scary experience after all. I had lots of fun in here. Given the chance, I will do this again soon. 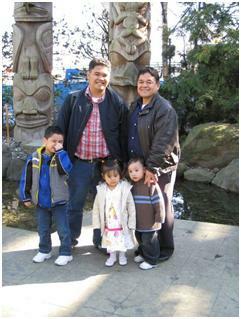 After that we went back to Whistler Village, grabbed some lunch and this time went up to the other mountain, Whistler. 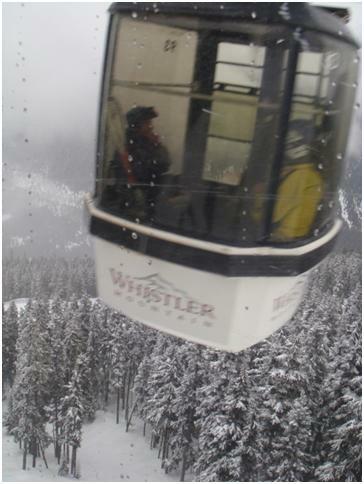 We took the Whistler Gondola to reach the peak; believe it or not it will take you around 20-30 minutes one way. Along the way we could see some nice sights of trees covered in snow and it is so beautiful. When we reached the peak, we are surprised that there is an actual lodge where people can eat, rest and warm themselves up and the place is so nice that the three of us were thinking why didn't we go up to whistler mountain first (well if we did, we missed the Tubing at Blackcomb). We were also told that they are building a peak-to-peak gondola between the peak of Whistler and the peak of Blackcomb and it will be ready at around December 2008 just in time for the Vancouver 2010 Winter Olympics. In case you're just wondering the peak-to-peak gondola if you're going to measure it from sea-level will be as high as the Empire State Building in New York. I really hope that I could get back there so that I can experience it. 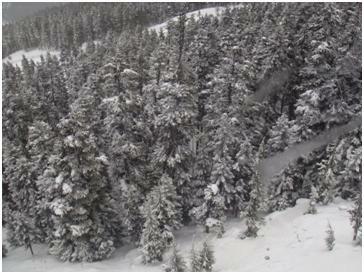 One lesson I learned in Whistler Mountain is that never to remove one layer of clothing from your body at any time. I did remove one layer since there is too much warmth, but I didn't expect that it will be too cold up there. We did not spend that much time at Whistler Mountain since our bus going back to Vancouver City is leaving at around 4:30 PM so we hurriedly went down and walked fast to the bus, but we came there just in time. 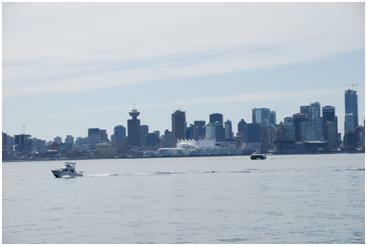 Since I am very tired from my day trip in Whistler, I slept in the bus and just arrived in Vancouver. 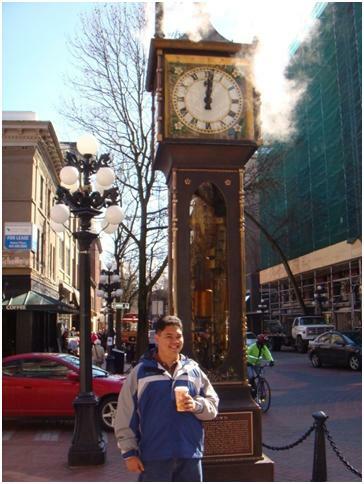 Last week, I just came home from my trip in the United States and Canada. I've been there for forty-five days straight and I can't believe that in just a span of a month and fifteen days I, together with my friends and relatives we did accomplish a lot of things. 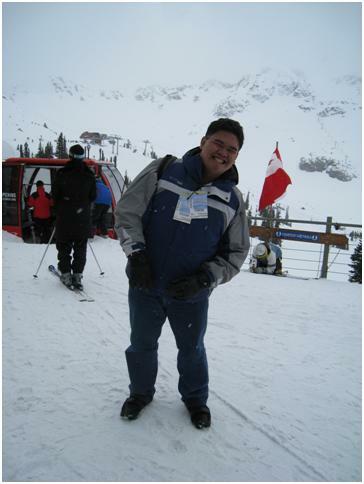 I have been from the Snowy Mountains of Whistler and Blackcomb, to the Death Valley in California. I basically have experienced everything in just a short span of time. Anyways I'll be blogging my experiences one by one in the coming days and months. 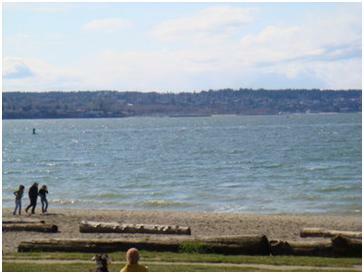 For the purposes of this blog, I will be sticking to lots of stories to tell since you know that explaining to do has a different audience set. ;-) You'll be seeing stories like my experience in this place and that place as well as what my thoughts are regarding something that I encountered on a specific trip. 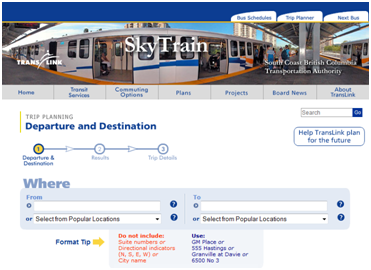 Another thing that I want to share is information about anything that I encounter on my trips that I think is important for you to know especially if like me you're a newbie too. I hope you'll journey with me through this blog, please feel free to comment anytime on any post that I'll be having here.